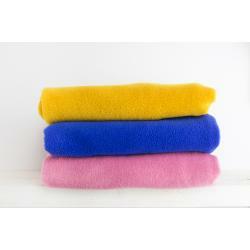 Fleece is a very soft and versatile fabric. This variant is quite thick and therefore also more durable. This fabric is made by spinning 100% polyester fibers into yarn. Lovely to make a blanket out of. Quality: Spun-Polyester (100%) Width: 150 cm Weight: 300 g/m2 Product code: 1620066..
Quality: Spun-Polyester (100%) Width: 150 cm Weight: 300 g/m2 Product code: 1620010..
Quality: Spun-Polyester (100%) Width: 150 cm Weight: 300 g/m2 Product code: 1620076..
Quality: Spun-Polyester (100%) Width: 150 cm Weight: 300 g/m2 Product code: 1620006..
Quality: Spun-Polyester (100%) Width: 150 cm Weight: 300 g/m2 Product code: 1620022..
Quality: Spun-Polyester (100%) Width: 150 cm Weight: 300 g/m2 Product code: 1620137..
Quality: Spun-Polyester (100%) Width: 150 cm Weight: 300 g/m2 Product code: 1620007..
Quality: Spun-Polyester (100%) Width: 150 cm Weight: 300 g/m2 Product code: 1620087..
Quality: Spun-Polyester (100%) Width: 150 cm Weight: 300 g/m2 Product code: 1620098..
Quality: Spun-Polyester (100%) Width: 150 cm Weight: 300 g/m2 Product code: 1620051..
Quality: Spun-Polyester (100%) Width: 150 cm Weight: 300 g/m2 Product code: 1620149..
Quality: Spun-Polyester (100%) Width: 150 cm Weight: 300 g/m2 Product code: 1620094..
Quality: Spun-Polyester (100%) Width: 150 cm Weight: 300 g/m2 Product code: 1620061..
Quality: Spun-Polyester (100%) Width: 150 cm Weight: 300 g/m2 Product code: 1620018..
Quality: Spun-Polyester (100%) Width: 150 cm Weight: 300 g/m2 Product code: 1620084..